Security Service Federal Credit Union, or SSFCU, is a national credit union that is focused on providing consumer banking and insurance services to people across the country. The credit union has some retail presence, corporate offices, and ATMs, but they are best known for their quality and secure online banking services. 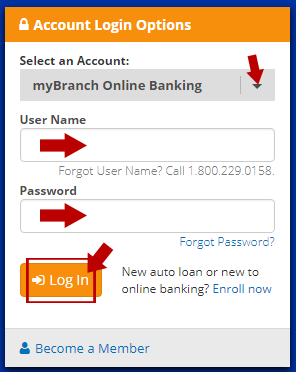 The instructions provided below will take you through the SSFCU login process that allows you to access your online banking account. Open your web browser and go to the SSFCU website, which is www.ssfcu.org. Notice on the left the SSFCU login menu. Start by choosing the type of account you want to access. Write your SSFCU User ID in the first blank box of the login menu. Write your password in the second box. Click the orange “Login” button to enter the SSFCU account you selected. Alternatively, you can go straight to the SSFCU login website, mybranch.ssfcu.org. Once there, use the same login steps outlined above to enter your account. Turn on your phone or other mobile device and open the search engine. Type in the SSFCU website address, www.ssfcu.org into the search bar, or go straight to mybranch.ssfcu.org. Type your SSFCU online banking credentials in the SSFCU login menu. Tap the “Login” button to view your account. Apart from its mobile-friendly website, SSFCU offers its clients and even easier way to access their online banking accounts. Android and iOS users can take advantage of the SSFCU mobile banking apps. In the following sections, we have provided login instructions for both apps. Open the Apple Store app on your phone and search for SSFCU. A new screen will open, which will prompt you to download the SSFCU mobile banking app. Type in your SSFCU login information. You will likely be asked some security questions. Once answered successfully, you will be taken to your accounts. Download the SSFCU MyBranch app. Write your SSFCU online banking username and password. After answering some security questions, you will be taken to the account overview screen. Overall, the Security Service Federal Credit Union online banking website is very easy to use, reliable, and secure. However, there are some common issues that could prevent your ability to use it. The most common problems that people have are forgetting their passwords. If you cannot remember your SSFCU password, you just have to click on the “Forgot Password” link in the SSFCU login menu. You will then be taken to the password recovery menu. If you forget your username, call the SSFCU tech support team at 1.800.229.0158. Likewise, for any technical issues with the SSFCU online banking platform, you should contact the tech support team. The Security Service Federal Credit Union is one of the leading federal credit unions in the United States, which provides banking and insurance services to many consumers across the country. Hopefully, this guide has provided you with all the information you need to access your SSFCU online banking account easily. For more information about the online banking service, you can visit the official SSFCU website, www.ssfcu.com. If you need any help with the online banking platform, you can contact the SSFCU customer service team. You can find their contact details in the Contact Us section at www.ssfcu.org.